The Rock-Art of the Mediterranean Basin on the Iberian Peninsula is a distinct rock art tradition consisting of 758 prehistoric sites in eastern Spain. They are located exposed in the open air. The first paintings were discovered in Teruel in 1903. They were made during the period 8000 - 3500 B.C. These rock art sites form an exceptionally large group, the figures are relatively small in size and depict scenes from the transition stage from huntergatherer to a sedentary farmer. The subjects include hunting scenes, funerary rites, mythology, female figures and details of clothing and personal ornaments like hairstyles and bracelets. Out of the 727 nominated locations, I visited 4 or 5 panels in the Sierra de Albarracín. I say “4 or 5”, as I couldn’t identify the 5th on the long list of sites. But they are all in the same area, in a protected zone called Pinar del Rodeno. This is a popular hiking and climbing destination for Spanish tourists. I started at the “Abrigo de la fuente del Cabrerizo”. This one is located about 4km south of the town of Albarracín. There’s a sign from the road and a small parking lot. You then have to hike downhill for about 20 minutes. First you pass a good viewpoint with views on the red rocks and the maritime pines that are characteristic of this landscape. Then the path worsens, gets muddy and narrow. 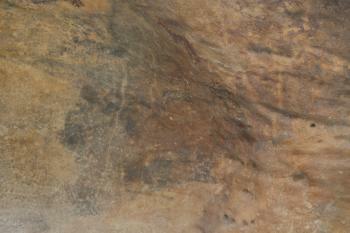 I wondered how many people go out all the way to see the rock paintings here. Fortunately there are red arrows that show the way so you will not get lost. The paintings are protected by a red fence, and there is an informationpanel (in Spanish) about what you see. If you are able to see them at all, as they have no colour and are merely the outlines of animals. Pretty disappointing, but I had my daily exercise in getting there and would get some more climbing back up the steep hill for 20 minutes. The other 4 panels are near the more busy Prado del Navazo recreation area. It is the starting point of several hiking trails and a place where rock climbers gather. You’ll recognize these individuals as they are carrying what looks like mattresses on their backs (the “crash pads”). 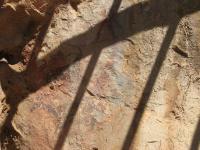 There is a hiking trail, Sendero 2, that will lead you along several rock paintings. However I opted to visit the ones quite close to the entrance. This also involves some hiking, but on a more pleasant and flat path than I experienced earlier in the day. To get in front of the rock paintings, you will have to scramble up the rocky slope for a few minutes. Two out of the four panels here were very difficult to see also, and not really of interest. The other two at last gave me a feel for Mediterranean Rock Art. The first was the Abrigo de los Toros. This is a rather large panel, over 4 meters wide, showing 19 painted objects. Their colour is white, and mostly the group of bovines stand out. This is Spain, so no wonder the Toros are the main elements! The other panel is the Abrigo del Tio Campano. This one was only rediscovered in 1981. It has a triangular shape, and shows red painted animals. As a general conclusion I would say that I wasn't really taken by these expressions of rock art: there are much better examples around the world. I found them quite primitive, both in style and in subject (the common hunting themes). However, this region warrants a visit for its fine natural surroundings and the pretty Moorish town of Albarracín. I only have a sample size of one, but I suspect that only a small portion of the locations that comprise this WHS offer any rock art that is worth the effort to see. The easy rule of thumb should be that if searching the internet does not yield explicit mention or photos of discernible rock art in a given location, it probably has little-to-none. I went to see Pedra de les Orenetes because it is located not far from my recent base on Costa Brava. It turned out to be quite accessible: If you park in a dead end at the edge of Urb. 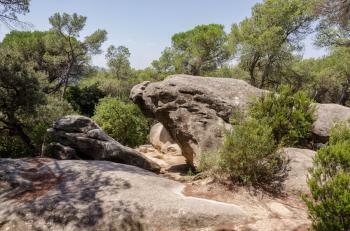 La Pineda in El Bosc de Ruscalleda, it will take you only 15-20 minutes of walking on the relatively flat Ruta Prehistorica to reach Pedra. Which turns out to be an expressive pile of rocks. If you are into rocks and hiking - great. If you are after prehistoric art - tough luck. All you will find is a couple of smudges that indicate where the drawings used to be. I allow that a recognition that an ancient human once drew on these rocks may be worthy of the WH inscription, but it's a stretch to count this location as an exhibit of the prehistoric art. As is a stretch for me to count this WHS as visited. My personal definition of "visited" puts premium on the effort to see any inscribed component of a given site. The effort I made. But without actually seeing any rock art, I have to put an asterisk against this entry until I get an opportunity to see better preserved examples. Visited Caves of El Cogul on the way from Poblet monastery to Zaragoza. Unfortunately due to time constraints arrived there right in the beginning of siesta. The place is located in the pleasant agricultural scenery in the outskirts of Cogul village. There is a small visitor centre and the access to the cave is fenced. I climbed the fence and made some picture of the cave, which is also covered by an iron lattice (it could only be open during visit time). The paintings are of course not so bright but are quite visible. There are over 40 african-style figures painted, including humans and animals in black and red. The most famous and central is dance scene. There should be somewhere Roman inscription as well, but I couldn't identify it. In overall nice place with easy access and not disappoitning paintings. Vistor centre probably has some useful information, will try to return here next time outside siesta time. I visited this WHS in March 2016. 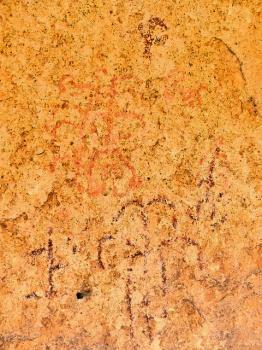 Out of the 758 inscribed sites I focused on the Levantine rock art of Monte Arabí. Monte Arabí is a mountainous elevation with an altitude of 1,068m a few kilometres away from the town of Yecla in Murcia. It is dotted with a number of different caves with different geological formations, prehistoric engravings, prehistoric marks and prehistoric paintings. These range from simple geometric drawings to figures of humans and animals, including hunting scenes which are still exposed in open air and only protected with cage-like gates. Initially I had planned to visit the Cova dels Cavalls (which has probably the best inscribed example of a painted hunting scene) in Valltorta together with the new museum on my way to Teruel. Due to the Fallas festival I had to change my plans and so I decided to visit the Cueva del Mediodía, the Cueva de la Horadada (only geoligical formations), the Cantos de la Visera I and II and the Arabilejo and its cup and ring marks in the Campo de Cazoletas. I started with an early visit at the archaeological museum in Yecla, known as the Museo Arqueológico Municipal Cayetano de Yecla (MAYE). It has artefacts and information from 4 eras but my main focus for the day was the prehistoric era. There is quite a lot of information on the rock art of the Mediterranean basin in Murcia and the usual pottery, tools, bones on display. The most important artefact they have on display is petroglyph stelae. The museum has a very informative app if you're an Apple user. My main goal was to visit Monte Arabí and the rock art in Cantos de la Visera I and II. You can only visit these sites on a tour, if you have a municipal permit or as was my case if you're accompanied by someone from the MAYE. Usually there are tours at 11am but these only take place when there are groups rather than for individuals. On the day of my visit the town of Yecla was like a ghost town as most of the locals were in Valencia for the Fallas festival. However, when the two youngsters on duty at the museum saw my determination to visit the sites and heard that "someone from so far away as Malta had bothered to visit" (most of the tourists that visit are Spaniards), one of them offered to accompany me to the gate on Monte Arabí leading to both sites if I would bring him back to the museum by 2pm (the museum closing time). Sure enough that is what I did and let the guy drive as the trip involved a lot of turns and shortcuts on unpaved roads. We arrived in about 20 minutes but it later took me double that amount to return on my own. More on that later. The walk from the gate to the Cantos de la Visera I and II is a good 20 minute walk on a garigue-like terrain. Don't expect perfect trails so good hiking shoes are definitely a plus. 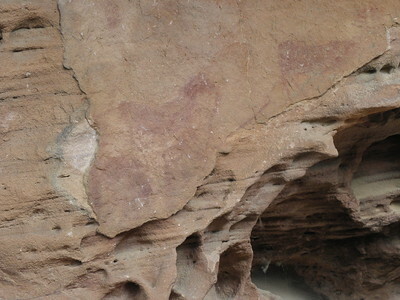 On the first ridge there are around 40 animals depicted dark red, mainly bulls. Only 2 of them were clearly visible because of the natural erosion together with the fact that the enclosures and shade make viewing even more difficult. However, I was thrilled to see the real thing and not a replica this time round. On the second ridge supposedly there are around 70 animals depicted, again mainly bulls but also deer and birds. The only reddish-black painting I could discern here was that of 2 bulls facing each other as it happened to be closest to the enclosure. Towards the top and before going back to the museum we saw the peculiar ring and cup marks at the Campo de Cazoletas which really reminded me of the several 'cart ruts' in Malta and Gozo. We arrived back at the museum at around 13:30 and I couldn't thank the guy enough for his time and generosity. Just before saying goodbye he mentioned another cave in Monte Arabí containing geometric drawings and another one with interesting geological formations which were on the other side of the Monte and with free access for individual visitors. Since I had enough time before heading to Elche, I decided to give it a try to see another aspect of this never-ending series. Getting there was the main obstacle. There are no road signs whatsoever and there are enough hillocks or mountainous elevations nearby Yecla to keep going around in circles for a long time. However, with a bit of luck and asking a few kind passer-bys just outside Yecla, I headed first in the direction of Fuente Álamo and shortly after continued on the right in the direction of Jumilla and Montealegre (del Castillo). After the milestone of KM 12, I spotted a huge Unesco billboard close to an unpaved tractor trail! I followed a sign to Casa de Don Lucio and after a bumpy road I parked my car and walked the last kilometre uphill through the garigue-like terrain to the Cueva del Mediodia. The 'cave' had a number of geometric drawings in 3 colours: a group of human figures with arms entwined in light red, yellowish zigzag figures and a dark red human figure and a figure in the form of highly stylized palm tree with a double symmetrical arched branches (picture). The Cueva de la Horadada only had a couple of geological formations and a hole in the ceiling which I only saw as a short cut on my way back to the car. I really enjoyed my visit mainly because of the difficulty to find any straightforward information about this site and the satisfaction of visiting the actual paintings and not a replica. If I ever visit Teruel, to complete the Mudejar inscription, I'll surely give Valltorta a try as the paintings there seem to be on par with those of Alta, Norway. However, more effort should be done by Spain to offer a coherent and straightforward visit for the interested traveller. As noted, there are over 700 sites all over the Mediterranean area which are included in this list. Unfortunately the ancient people who made them were in much better shape than most of us today, so they are not very easy to reach! Also many of the sites are frankly a bit boring unless you have a special interest in rock art, like me, because the images are very difficult to see or there are not many of them to begin with. Some sites in Murcia have recently been developed for better tourist access. Some examples are La Serreta and Los Grajos near Cieza (contact the museum in Cieza for a guide), and Cantos de la Visera near Yecla (contact the museum in Yecla). Others I have been to that have some tourist access and interpretive signs include Pla de Petracos and La Sarga, near Alcoi in Alicante (check with the museum for directions, they may also be able to send someone with you). Probably the best place I know of to see some examples of this rock art is at the sites in the Valltorta area of Castellón. There is a fairly large rock art museum near Tirig, which has reproductions of some of the more interesting sites, and they arrange tours with a guide who will take you to the sites and show you the rock art. The sites are again not accessible if you have major mobility issues but the hike to most of them is fairly moderate, and the sites themselves have platforms built around them so you don't have to cling to the side of the cliff to see the art! Most of the sites are not easy to access, especially if you have mobility problems. Cantos de la Visera might be manageable for some, because the shelters are not in the mountains. However you have to walk up the road to the site from the parking area, which is a moderate walk but I don't think it would be wheelchair accessible. Yes, indeed this inscription is strange, but there is at least one place where you can enjoy visiting several mural paintings at once: Sierra de Albarracin (Teruel) inside "Paisaje protegido de los pinares de rodeno" park. This place is located near Albarracín one of the most beautiful towns in Spain. Having just looked at the inscription in more detail I have discovered that it is made up of a whopping 727 seperate sites!!. This is one of the strangest inscriptions there is on the WH List, I am sure they are very justified but there are 727 of them!! They are scatered from Barcelona down to Gibraltar. I am pretty sure I have visited at least one of these sites in the many times I have visited Spain, but I am not willing to count it as a site that I have visited properly. I have a feeling I have visited some of the sites in the María and Alicante area when I was much younger, so I am adding this to the group of sites that I have not really visited but have seen, (this list is getting frustratingly long!!) oh well! It was very hard to find on the Internet for our trip around Spain a rock art site of those being part of this WHS satisfying the criteria I had in my mind for choosing one of them: proximity to our Spanish itinerary, good accessibility without too much walking - they are often situated at high altitudes far away from main roads - … possibly a cave with a guided tour - but I didn’t find one available without booking and there is also the fact that this sites are mainly shelters. Finally I chose the site of Cabra Feixet in Catalonia near El Perolló putting my trust in this two Spanish web pages: http://www.xtec.es/centres/e3001929/cabra/cabra2.htm and http://www.arqueomurcia.com/arterupestre/catalu/feixet.htm. From this descriptions with map it seemed to me that it was easily accessible, but I was wrong. You have to take the road going from El Perolló to Rasquera and after 7 km you will find without problems on your left a sign telling you that the rock art site is 3,5 km from there (we didn’t notice that there was also written with pencil in French that it is quite impossible to reach it by car – maybe a desperate tourist had left it). So we ventured with our car to a road that after 1 km turned out to be unsurfaced, extremely narrow and endless. We couldn’t turn back the car and go away and, risking to have an accident, had to arrive to the parking (it seemed incredible that this road, that ended there, had been designed expressly for reaching the rock art site). Here some unclear signs bring you, in much more than the 10 and 25 minutes written there, to the highly disappointing site of Cabra Feixet, a small prehistoric shelter protected by a cage, where might be 13 red painted figures, but only 3 are clearly visible - a hunter and two animals - and to some shelters without paintings not being part of the WHS. Certainly the landscape in which it is situated, with spectacular rocks and a luxuriant vegetation, is more interesting than the rock art site itself. Now, an advice: don’t go there, above all not with a common car. It is one of the most disappointing WHS I have ever seen. Maybe I have just chosen the wrong site and probably there are much better places included in this WHS (there are also municipalities with more than 50 rock art sites while Cabra Feixet is the only one in El Perolló). Certainly Cabra Feixet doesn’t deserve its inscription. However I have seen only this site, so I can’t say if the overall site deserves it. But I’m sure that there will be also other sites like this, so the inscription of 727 places on the WHL, even if they constitute the largest group of rock art sites in Europe, is excessive and could be inscribed only the most representative sites that probably deserve their place on the WHL. This sites are generally in the middle of nowhere so their conservation and authenticity is certainly perfect. The most similar WHS to this that I have ever visited is that of the prehistoric sites of the Vézère Valley in France, where the paintings are quite similar to those of Cabra Feixet, in a much bigger extension, much more worthy of being visited and certainly deserving their place on the List. In the picture are the three red figures of the shelter Cabra Feixet: a hunter and two animals. Now shows 758 locations instead of a previous number of 722. Exact locations inscribed twice (or more): Rock Art of the Mediterranean Bassin location no545 (Abrigo de la Ermita de San Urbez near Fanlo) situated within Pyrénées-Mont Perdu borders. Free entrance: Some might have an entry fee, but a lot of them are free and there are no obvious major sites among the 727 locations.